The European Space Agency has launched the fifth and sixth Galileo satellites from its launch pad in French Guiana. The boffins are now increasing the frequency of launches to get the entire network of 30 orbital birds ready by 2017 – three years early. The latest sats were launched on Friday at 1227 GMT using a Russian-built Soyuz rocket. Three hours and 47 minutes later, the two were successfully deployed at an altitude of 23,500km. There they began communications with the Galileo Control Centre in Oberpfaffenhofen, Germany, and the Galileo testing facility in Redu, Belgium. "Following the successful qualification of the system during the In-Orbit Validation (IOV) phase, achieved with four satellites launched in 2011 and 2012, the Galileo satellites are being produced and readied for the launch pad in series," said the ESA. 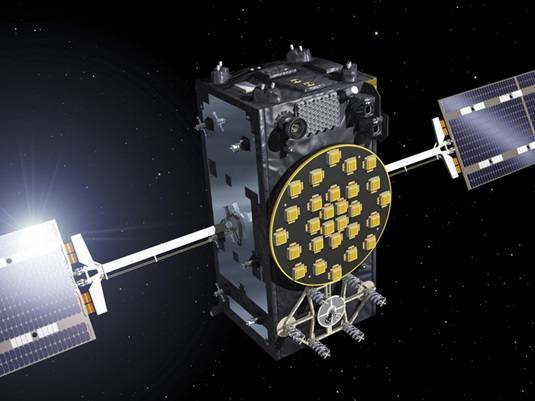 "The deployment of the constellation will now gather pace, with six to eight satellites launched per year using a series of Soyuz and Ariane launches from the CSG, along with finalisation of the remaining elements of the ground network. The final constellation will consist of 24 satellites expected to be ready in 2017 and complemented by six in orbit spares." The ESA had planned to have 18 satellites aloft and was expecting to have the full grid operational by 2020, but the early finalization of the satellite hardware and the purchase of additional Soyuz and Ariane parts has allowed it to get ahead of schedule. There's good reason to move things forward faster – anyone who's anyone is getting a satellite navigation system in place. Russia is updating its partial GLONASS system deployed during the Cold war; China already has its Beidou network providing GPS in the Middle Kingdom; and India's IRNSS system has two birds aloft.